Fall fashions in indoor plants include styles for every taste. There is a handsome dwarf tree fern, a striped African accent plant, a curious lily with a shape like a chorus girl, a diminutive tree-like plant only 6 inches tall and a gesneriad vine with scarlet blooms. These house plants have been brought from the far corners of the world to America where they will be propagated and sold across the country. Actually some of them were discovered and described a hundred years ago. But only now are they becoming available to the indoor gardener. 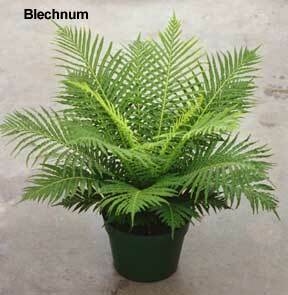 One of the most spectacular of the newcomers is an exotic dwarf tree-fern from New Caledonia, Blechnum gibbum. Until now tropical tree-ferns could not be considered house plants by any stretch of the imagination. Their size and temperament limited them to humid conservatories and greenhouses. However, the new dwarf form, standing only 2 or 3 feet tall, is just right for indoor use. Eventually it may grow to a height of 5 feet, but even this is not too large for a spacious “Florida room” or an enclosed patio. The metallic-green fronds are deeply toothed, as can be seen in the image. They are 2 to 3 feet long, of firm texture and are gracefully erect. This tree-fern deserves a prominent spot and will need lots of room. It will grow well despite a dry atmosphere but needs warmth. The night temperature should not fall below 60°. Pot loosely in a coarse medium containing sand, loam and peat or leafmold. Keep the soil damp – neither dry nor soaking wet. Keep water off the fronds during cold weather, but during hot weather rinse the foliage frequently to discourage thrips. The stripes of the tiger are stamped on the foliage of Dracaena Goldieana, making it look as African and as handsome and bold as its animal counterpart. Dracaena Goldieana, modernistic with its stripes of green and white, has the desirable qualities of the more common dracaenas – durability, shade tolerance and cold resistance – that have made them. favorite house plants for years. A very curious member of the lily family is the bottle plant, Beaucarnea recurvata. Shaped like a chianti bottle and topped with a cascade of 18-inch blade-like foliage, the bottle plant could be said to resemble a long-haired palm, if there were such a thing. And it is just as amenable as a palm for growing indoors. The bottle plant has a 6-inch waist and a 12-inch base and, since it grows very slowly, usually reaches a height of only about 2 feet. Native to the dry areas of Mexico and Guatemala, it is quite well suited to dry, indoor conditions. Pot it in a mixture of sandy loam and provide good drainage. It should be watered less often than other house plants; in winter give it water only when it is very dry. As the plant grows taller and the trailing leaves grow longer, you may want to clip the ends. My beaucarnea fell on its head and lost several leaves. It was given a 6-inch “crew cut” and was none the worse, since the growing center was not injured. In the summer the bottle plant should be placed out on the terrace or atop the garden wall – either in sun or shade. In any location it is a conversation piece. For the gesneriad collector there is the lipstick vine, a Japanese species named Aeschynanthus, fine for growing in hanging baskets. Grow it along with African-violets, gloxinias and episcias. It is different from all of these and will add variety to the collection. The foliage is attractive and the flowers are spectacular. The scarlet tubular blooms are bigger than the 2-inch leaves and appear near the ends of the streamers. They curve slightly upward from the stems. Similar to the columnea (but smooth instead of hairy), the vine also looks like a hoya – but is easier to grow. This plant comes from the hot, damp woods of Java. It should be watered copiously when growing and should be kept dry and cool in winter. The container should be one-quarter filled with crocks. Use a light but rich compost and cover the roots with sphagnum moss. This vine may also be grown on a pole for height or on a tree-fern slab like a staghorn-fern. But don’t disturb the roots any more than necessary when a shift to a larger container is required. To propagate, take half-ripe cuttings in the spring, each with two leaves and two joints. Pinching out the growing shoots encourages branching. The tropical aralias, resembling little trees with their woody trunks and leafy branches, are most attractive and useful diminutive plants. Aralia filicifolia is finely cut and as light and airy in character as a South Pacific breeze. The foliage looks almost like parsley. Aralia quinquefolia has thick, dark-green leaves that are broad and sturdy; they are shaped and textured like those of an oak tree. A bonsai oak couldn’t be more attractive. An unnamed species has leaves like fern fronds, several on each branch. These aralias will lose their leaves if chilled below 50° to 55°, and a minimum temperature of 60° is almost essential for them. Many aralias are listed botanically under other genera but Hortus [Hortus Second] says they are “known and cultivated as aralias.” That applies to these species, too, which may technically have other identification. Welcome additions to the shade-loving hoffmannias (quilted taffeta plants) are two new introductions: H. roezli, bronzy-green and lavender, and H. vittata, silky dark-green veined vividly with old rose. The foliage is puckered, and the leaves rise from the center of the plant to make a graceful circle like a skirt over hoops. The beauty of these hoffmannias shows off best when viewed from above. An antique coffee table is the perfect setting for such Victorian-looking foliage. These sophisticated members of the coffee family are tropical American in origin. Most of the plants are only a few inches high. Their muted colors are their chief attraction. They grow best if the pot is set in a saucer of damp sand, with a top dressing of sphagnum moss to keep the roots cool. A small-leaved new creeper, also for the coffee table, is Chamaeranthemum gaudichaudi from Brazil. The leaves are beautifully marked – green at the edges and clouded with grey in the center. The plant is similar to some of the episcias and marantas and is really for the connoisseurs as it will damp off if it is given too much moisture. Tall, slender spikes bear unimpressive little white or yellowish flowers. It is the foliage that counts. This plant is of the same family as aphelandra, crossandra and fittonia.